DENUGU, Ghana, Feb 28 2014 (IPS) - Dunwaa Soayare, 45, a smallholder farmer, widow and mother of five had the sort of economic profile that meant she was denied access to credit from Ghana’s mainstream banking institutions. She had no collateral, no bank account and found it impossible to provide three meals a day for her children, let alone ensure that they stayed in school. But after joining the Asong-taaba Women’s Group, a cooperative in Denugu, Upper East Region, northern Ghana, her life has changed dramatically. Not only has she been able to provide for her family by moving them from their mud hut into the brick house she built, she’s also been able to provide tertiary education for children and has seen two of them qualify as teachers. “Aside from taking care of my children’s education I have expanded my farming from half a hectare to two hectares. I now cultivate one hectare of maize, half a hectare of millet as well as half a hectare of groundnut,” she told IPS. Soayare explained that from one hectare of land she harvests 15 bags of 84 kilograms each, which she sells for 70,000 Ghana Cedis (380 dollars) – a huge sum. The group, which started in 2008, raised 5,000 dollars at the end of 2013 from the weekly contribution of its 25 members – almost all smallholder farmers and the breadwinners in their families. 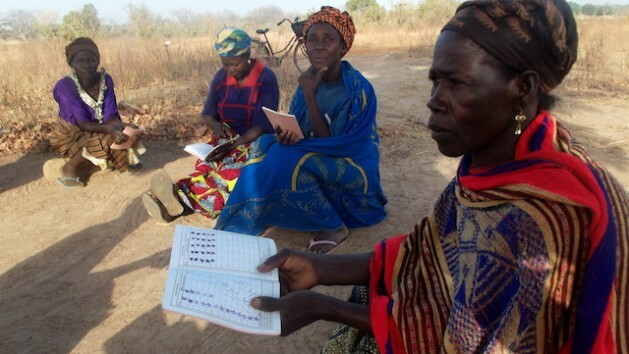 Every Monday, the women meet under a shea tree and pay their contributions of between 50 cents to five dollars. They are allowed to apply for a loan, which many use to fund alternative businesses if their crops fail. For Soayare it’s meant that she and her family are no longer vulnerable during the lean season. In Upper East Region the rainy season usually starts in May and ends in October. However, changes in the weather pattern now mean that the rains fall much later. So when the rains don’t come, instead of suffering through a crop failure, Soayare borrows money from the group and makes soap and buys vegetables for resale. “I don’t know what I would have done without this savings initiative,” Soayare said. But Asong-taaba is one of 500 groups in the district that involve almost 12,000 people, mostly women, scattered across the Garu Tempane district in Upper East Region. These cooperatives were started under a Care International project called Enhanced Savings and Credit Association for Poverty Eradication. Soayare and these thousands of women are living better lives thanks to the savings cooperatives. A Ghana Statistics Services 2011 survey shows that 31 percent of households in Ghana are headed by women. Regional director of the National Population Council, Zangbalum-Bomahe Amadu, said that due to polygamous practices in northern Ghana some men refuse to take care of their children, often leaving the burden to the women. “The situation becomes bad if the man dies…most women, who are mostly illiterate in the rural areas strive to take care of almost all the needs of their children,” he told IPS. Musah Abubakari, deputy coordinating director of Garu Tempane district, told IPS that the cooperatives have helped reduce poverty among many families in the area. “Most of them are engaged in different forms of economic activities. Many of them are concerned about the education of their children, so school enrolment has also increased in the last three years,” he said. Collins Kyei Boafoh, an outreach specialist at the Agricultural Cooperative Development International/Volunteers in Overseas Cooperative Assistance (ACDI/VOCA), told IPS that the village savings and loans concept played a critical role in the livelihoods of women and was also a climate change adaptation measure. “It is an open secret that for the past five years the savannah belt of Ghana, consisting of Northern, Upper East and Upper West regions, continue to experience low rains and long drought periods. This is not supportive of farming, which employs about 80 percent of people in the region,” he explained. Boafoh said the women’s cooperatives are now using their funds to venture into other activities like petty trading to supplement their incomes. “After the short farming periods, the women gather their monies in the form of community savings and offer themselves petty loans for trading, aggregation and processing. This gives them a sustained income and job security,” he said. Boafoh suggested that the initiative must be adopted, modernised and expanded by the government as a poverty-reduction initiative in the four poorest regions in the country namely Northern, Upper East, Upper West and Central Regions. Solomon Atinga is programme manager of the Presbyterian Agricultural Station at Garu Tempane – another Care International cooperative. He said the initiative, which extends to about 100 communities in the district, has had a positive impact on the lives of women here. They are able to take care of their children and support their extended family members. “In fact the living standard of the women and their families has improved tremendously,” he added. “This is a small project with a big impact…even though we are poor, we can save. The least amount a group usually raises at the end of the year is 2,000 dollars,” he said.